SALEM — Toward the end of each school term, my father, a school principal, used to spend more and more time each morning holding our dog by the snout and looking into its eyes: “I wish I had your life,’’ he’d glumly intone, before traipsing off to work in suit and tie. A dog’s life was preferable, he wanted us to know, to the tribulations of administering a school. Evidently the Qianlong Emperor of China, whose job was to administer the world’s largest and wealthiest empire, had days like this, too. Unfortunately for him, the Qianlong Emperor was never called that (he was the longest-living ruler in Chinese history and he died with his hands — effectively, if not officially — still holding the reins). But as the all-powerful emperor, he certainly had every right to pretend. And his chosen method of playing out the fantasy of retirement left the world with one of its most exquisite built environments, the so-called “Qianlong Garden,’’ situated deep within the Forbidden City in Beijing. The “garden’’ — really a complex of buildings and pavilions arranged around courtyards and landscaping — was the Qianlong (pronounced CHEE-en-lohng) Emperor’s intended place of retirement. He spent years designing it and fitting it out with the most refined, meaningful, and beautiful objects he could assemble. Everything was arranged according to principles based in Chinese philosophy, poetry, and aesthetic traditions. And yet much about the end result revealed qualities very particular to the emperor’s own character and his time. Ninety of these objects — from paintings and calligraphy through rocks, ceramics, European clocks, rootwood furniture, and exquisitely decorated panels, screens, and partitions — are now on display in “The Emperor’s Private Paradise: Treasures From the Forbidden City,’’ a revelatory show at the Peabody Essex Museum in Salem. How is it that we are getting to see these treasures in Salem? For one reason and another (blame China’s turbulent 20th-century history), the garden was allowed to fall into a state of terrible disrepair. Its contents — those that were not removed in the 19th and 20th centuries — have long been off-limits to the public. But in 2001, the Palace Museum in Beijing, which administers the entire Forbidden City complex, and the World Monuments Fund together set about a major restoration effort, due to be completed in 2019. It was only after Nancy Berliner, the Peabody Essex Museum’s curator of Chinese art, became involved with the project that the Palace Museum agreed to the idea of a show about the Qianlong Garden. The result is a tremendous coup for PEM. It’s the largest and most comprehensive traveling exhibition ever authorized by the Palace Museum. And after the restored garden opens to the public, this material will likely never travel outside China again. To some extent, the show is about the objects, each of which rewards close attention. Even more, it is about the garden itself. The exhibit invites us to comprehend it not only as a sanctuary for leisure, meditation, and entertainment, but as a fastidiously constructed private museum. The names of its various buildings certainly put you in a susceptible frame of mind: the Building of Extended Delight, the Pavilion of Soaring Beauty, the Hall of Fulfilling Original Wishes, and — a real spanner in the works, this one — the Studio of Self-Restraint. Opening onto it all is the Gate of Spreading Auspiciousness. Little was beyond the scope of the Qianlong Emperor. A contemporary of Louis XV, Catherine the Great, George Washington, and George III of England, he ruled an empire wealthier, physically larger, and more populous than any of them. The most imposing portrait of him in the exhibition shows a heavily set, long-faced, jowly old man with focused, intelligent eyes sitting squarely on a throne. You would not idly take him on — even if your name were Louis and your right to rule derived directly from God. The Qianlong Garden may have been the emperor’s final great artistic accomplishment. But earlier in his rule, he had designed other, more extensive gardens. None of them has survived, though certain themes explored in the earlier gardens recur in the Qianlong Garden, and Berliner teases them out in a fascinating catalog essay. The idea of the garden as a retreat, a place to meditate, write poetry, study the classics, and let the mind roam had a rich history in Chinese aesthetics. Such a place would be tightly constructed and sealed off from the urban environment, with carefully choreographed views and pathways in ancient-looking trees and rockeries. Interestingly, part of what the Qianlong Emperor brought to this tradition, from which he had deeply imbibed, was a fascination with Western aesthetics, including techniques and materials that were completely new in China. In the theater room of one earlier garden, for instance, he installed a painted ceiling depicting wisteria on a bamboo trellis in perfect European-style perspective. Later on in his rule, he became fascinated with the gardens and waterworks at Versailles (reciprocating a craze for Chinese pavilions and pagodas in Europe) and with the European tradition of trompe l’oeil, or “fool the eye,’’ painting, which used tricks of perspective to create heightened illusions of real space on a flat surface. In the show, we see various examples of this, none more striking than the huge and festive domestic scene painted by Yao Wenhan. Set back from a decorated wooden frame, the painting is a frolicsome riot of decorative pattern and domestic detail within a pictorial system based on single-point perspective. 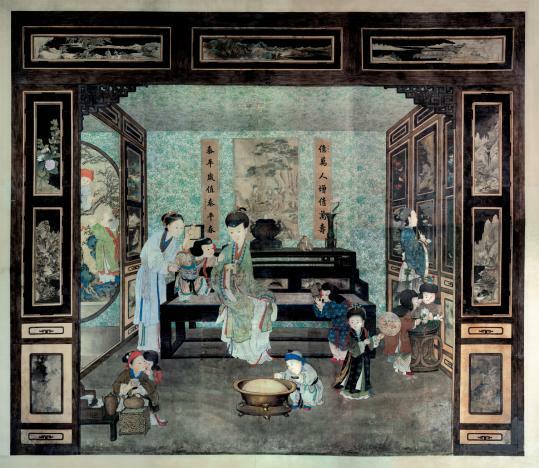 It shows a palace woman surrounded by cute children playing with tea sets, plum blossom branches, incense sticks, and musical instruments. The nod to Western styles of picture-making gives the image a veneer of realism. But the painting is actually packed with details of a Confucian bent: promises of longevity, peace, prosperity — and a multitude of male heirs. It must have been poignant to contemplate for the Qianlong Emperor, who, by 1775, had buried two empresses and 18 of his 27 children. The two sons he had ambitions for both died young. It was left to his 15th son, essentially by default, to succeed him as emperor. The painting contains a fascinating detail: Off to the right, a young woman gazes at her reflection in the mirror. Lacking the technology to produce glass, the Chinese had to import it from Europe through Canton, the one trading port open to international exchange. Thus, glass was rare — and as expensive as jade. But its appeal — especially in the form of mirrors — went deeper than its scarcity for the emperor, who clearly delighted in optical trickery and illusions, both painted and reflected. In one sense, this interest in illusions matched the whole conceit of the garden, which — as a sanctuary from political intrigue situated right in the heart of the palace, a mountain getaway in the center of the capital city — was nothing if not illusory. The show is packed with too many exquisite objects for me to describe. The influence of Western materials and aesthetics is only one small part of the story. More important are the many ways in which China’s three main religious and philosophical systems — Buddhism, Confucianism, and Daoism — make themselves felt in objects as diverse as the Tibetan mandala panel with circular niches; the panel studded with jade, lapis lazuli, malachite, and glass that shows a flowering plum blossom; and the elegantly simple lotus-shaped door surround. One of the show’s highlights is a series of 16 vertical panels made from zitan (a rare and dense wood scattered throughout the show), with jade images inlaid into lacquer. One side of the panels — almost perfectly preserved over the centuries — shows 16 different plants in ravishing detail. The other side shows 16 “luohan,’’ disciples of the Buddha who achieved enlightenment. They are, to a man, spectacularly ugly: craggy, leering, saggy, emaciated, with ridiculously overgrown eyebrows, preposterous noses, and bulbous, potato-like skulls. The Qianlong Emperor never did retire to his garden. He kept to his early promise that his own rule would not exceed the 60-year rule of his grandfather, the Kangxi Emperor, though he retained most of the prerogatives of power and continued to occupy his old quarters even after he handed power to his son. The emperor’s last decades in power were marred by spreading corruption and personal unhappiness. But he could always turn to his garden to forget the cares of power and imagine himself in a mountain realm consorting with philosophers and poets. Or maybe just stare forlornly into the eyes of a dog. At: Peabody Essex Museum, Salem. Through Jan. 9. 978-745-9500. www.pem.org.